Here are some of the Appalachian style baskets I have made over the years. Most of them I weave out of reed, but I have split my own white oak before. This was the first style of basket I started to make and continue to make them now. Most of the classes I teach are of this style with the ribbed (egg) baskets being my specialty. You can see some of the baskets I collected from the Appalachian Mountains in My Collection. 11" x 11" This was an early (1984) ribbed basket I wove for my grandmother. It is woven of natural and dyed reed on oak hoops. I am not sure what I used to stain the basket, it looks like it was possibly coffee or tea, but in 1984 I was probably still using wood stain. 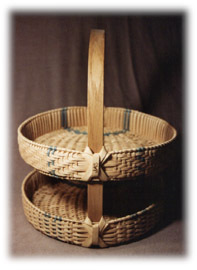 I made this basket at the 2000 Missouri Basketweavers Convention in St. Louis. The workshop was taught by Arkansas native Luke Block. 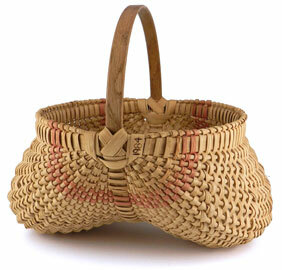 The basket was woven of natural, walnut dyed and color dyed white oak. The handle was made of dark walnut. 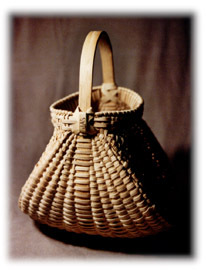 I made this basket at the 2000 Missouri Basketweavers Convention in St. Louis. The workshop was taught by Arkansas native Luke Block. 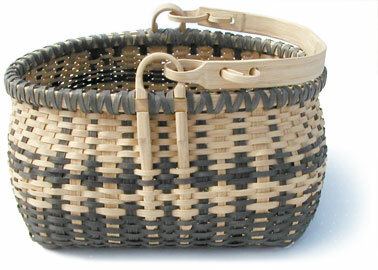 The basket was woven of natural, black dyed white oak. The dark gunmetal gray/black color was achieved by soaking the white oak with rusty nails. The tannic acid of the oak reacts with the iron in the nails to create the unexpected lovely black color. The basket also features a swing handle with a "pig-tail" looping hinge. 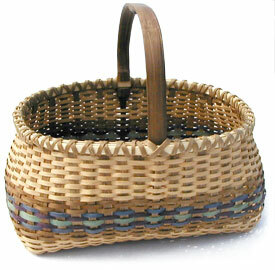 I made this basket in 1984 in a class taught by Gertie and Estel Youngblood at the Appalachian Center for Crafts. It is woven entirely of hand-split white oak. It was a wonderful experience learning to make a basket from a log of wood using only a few basic hand tools. I only wish my weaving skills had been better at this early stage of my basket making. One day I would love to take another class like this. 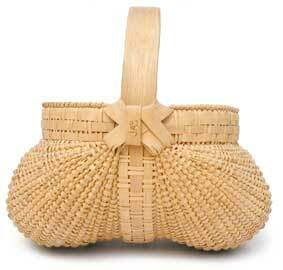 I have only woven 3 lidded baskets like this one. The latest one I patterned after an old Cherokee basket my parents had in their collection. On this particular basket only one side opens as I wanted this for a tool tote and didn't want everything to spill out in my truck as I travel to and from classes. The hinges are carved from a stick of white oak. The hoops are also oak. 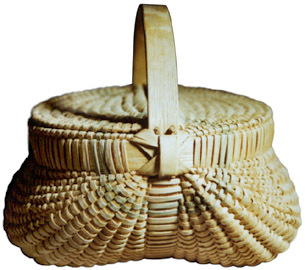 The body of the basket is woven of flat reed over round and oval/oval ribs. 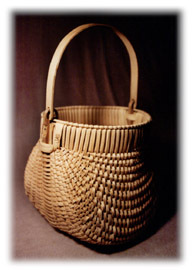 This basket was woven of reed over a preassembled frame. I wove the "bottom" tray first then the "upper" one. I wove this basket almost 10 years ago and long ago sold it. I have not made another one like it, but as it has generated the most email inquiries, I may have to try my hand at another. I believe you can purchase frames like the one I used here from The Country Seat, Inc. basket shop in Kempton, PA. I recently purchased this basket back from the original buyer. They made a profit off of it too! I have only made a few of these uniquely shaped baskets. It is named after the oriole bird nest, which it resembles. It is woven of flat, round and flat oval reed over a specially bent frame. A basket like this takes a lot of "filling in" to compensate for the small opening and bulbous body. This basket was woven of reed over a frame I constructed from a 10" swinghandle and a 10"x1.5" round hoop, the bottom "U" shaped frame I bent myself. I nailed all the pieces in place to sturdy the frame for weaving. This shape is basically a modified oriole basket form as seen above. It has a flat bottom which makes for a stable base.